Here we have 8 Guards (Grenadier, due to white plume) all dated 1.7.1901. Made by Wm Britain. Have posted underside as well to show date etc. hope you like. Also some plastic Timpo Guards. A nice early group, although being 'square base' I think these examples are a little later than 1901. Their 1901 copyright would have been for the first 'oval base' version, but would have continued as a slight change such as base shape didn't affect the actual soldier. I love how all the early soldiers had moustaches painted on. Soldiers were required to grow a moustache (with allowances for young soldiers and the naturally not hairy who couldn't grow one) because a moustache was considered manly. I think this rule was dropped sometime during WW1. Hi. The painting of these early figures always impresses me. Does anyone else have similar photos to share? I'll do some over the coming days, & I'm sure there are a few other members who have some vintage non-animal figures. Hi. Some very nice figures. 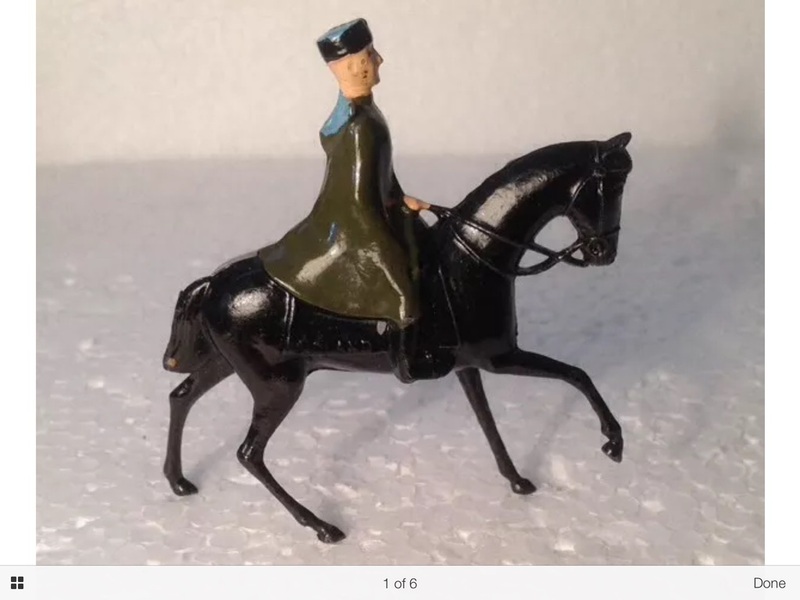 I have picked out one of my favourite mounted soldier figures from my lot. The horse is amazing. What do you think? Yes, that's one on my wants list - the Britains 2nd grade Cossack. As you saw in the Indians thread, I have quite a lot of Britains 2nd grade, mainly because they're usually cheap, and the range is quite large, but small enough that gathering a complete collection is a realistic possibility. 'fraid mine go on my blog! While this is obviously the case for large numbers of photos Hugh, I hope you'll post the odd one or two here as well if it is particularly pertinent to a conversation. While this is obviously the case for large numbers of photos Hugh, I hope you'll post the odd one or two here as well if it is particularly pertinent to a conversation. D.
I will when I can, but like with these...I've thrashed plastic guards on the blog!! !